At STARTTS, we believe in evidence-based practice and we are committed to continually learning and improving. This process includes reflecting on what we’re doing and how we can better meet the needs of the communities we work with. Evaluation is an important part of our work. Measuring the effectiveness of our projects allows us to document and share important lessons and best practice guidelines, tailor our programs to better meet the needs of refugee communities and individuals, and involve our clients actively in the process of feedback and reflection. STARTTS offers community development evaluation training as part of its Community Development training program. 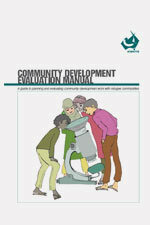 As part of our unique approach to evaluating community development programs, STARTTS has developed a Community Development Evaluation Manual as a reference guide for our staff and other refugee settlement service providers. The full manual is available here as a free download. In partnership with the Centre for Refugee Research at the University of New South Wales, STARTTS has developed a new methodology for measuring the social capital impact of our community development programs. This exciting project involved people from refugee backgrounds in the design of an evaluation tool developed specifically for the Australian refugee settlement context. STARTTS also offers training on designing and evaluating projects to increase social capital in refugee communities upon request. In addition to evaluation, STARTTS is conducting a number of research projects. Further information about our research can be found here.